SOURCE: AP/Jim Mone Anecdotal evidence has led to the impression that many in the scientific community hold a negative view of law enforcement. Before the two communities can solve this problem, we need to get a sense of the types and range of views scientists hold. Anecdotal evidence, including several high-profile cases of scientists under criminal investigation, has led to the impression that many in the scientific community hold a negative view of law enforcement [1, 2, 3]. While justified in some cases, this divide is a serious liability to law enforcement, since cooperation and consultation with scientists aids in threat assessment, investigation, intelligence gathering, and the recruitment of personnel with specialized skills. But before the two communities can solve this problem with training for law enforcement personnel and through outreach to the scientific community, it is necessary to get a sense of the types and range of views of law enforcement within the scientific community. Here we present the results of a survey of the scientific community conducted in conjunction with the FBI to evaluate the working relationship between FBI field agents and scientists. The survey was sent to 10,969 members of the American Association for the Advancement of Science between January 23 and February 18 of this year. 1,332 surveys were completed, and the resulting data produced an average margin of error associated with the total data set of +/- 2.7 percent. A complete version of the survey questions is available in the supplemental material (Table 1). Nathaniel Hafer, Cheryl J. Vos, Michael Stebbins: The Federation of American Scientists, 1725 DeSales Street NW, Washington, DC 20036. Karen McAllister, Gretchen Lorenzi: The Federal Bureau of Investigation, 935 Pennsylvania Avenue NW, Washington, DC 20535. Christopher Moore: Greenberg Quinlan Rosner Research, 10 G Street NE, Washington, DC 20002. Kavita M. Berger: The American Association for the Advancement of Science, 1200 New York Avenue NW, Washington, DC 20005. The attitudes of scientists toward law enforcement personnel are not vastly different from those of the general public (4) (Figure A, below). However, a larger percentage of scientists indicated cooler feelings towards the FBI than the general public, suggesting that these reservations are particular to the scientific community and require specific solutions with the scientific community in mind. The results show that scientists hold more favorable feelings towards state and local law enforcement than federal law enforcement. However, when confronted with specific issues or concerns, the responses reveal no significant distinction between interacting with the FBI or with law enforcement in general. Generally speaking, working in a specific scientific discipline has less effect on an individual’s view of law enforcement than demographic factors. 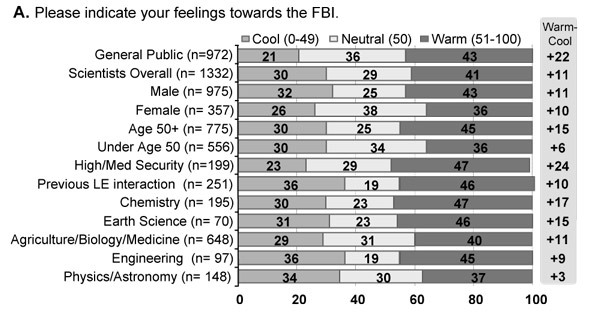 Instead, trends suggested that male scientists and those over 50 years of age have a more positive attitude towards the FBI (Figure A, above). It should be noted that those scientists holding high or medium security clearances—and therefore arguably more likely to have firsthand contact with federal agents—had the highest level of warm views (47 percent) and the lowest level of cool views (23 percent) toward the FBI of any cohort covered in the survey. 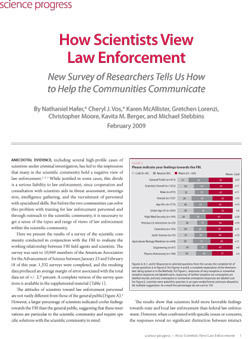 The survey also revealed that scientists are receptive to the idea of discussing their research with other scientists (93 percent), interested members of the public (87 percent), and journalists (72 percent), but are markedly unreceptive to sharing their work with law enforcement (federal 36 percent, state 34 percent, local 33 percent) (Figure B, below). Figures A, B, C, and E: Responses to selected questions from the survey; the complete list of survey questions is in Figure D. For Figures A and B, a complete explanation of the thermometer rating system is in the Methods. For Figure C, responses of very receptive or somewhat receptive responses are labeled warm, responses of neither receptive nor unreceptive are labeled neutral, and very unreceptive or somewhat unreceptive responses are labeled cool. For Figure E, scientists were asked this question in an open-ended format and were allowed to list multiple suggestions. As a result the percentages do not sum to 100. Perhaps the most striking of the results is the indication that scientists are suspicious of the FBI and feel that they do not work well with the scientific community. Some scientists who had professional interactions with law enforcement reported that they had been questioned about the purpose of their international travel, asked to “spy” on their foreign colleagues, and in one case had a computer confiscated and searched. Specific concerns include the belief that law enforcement does not understand their work (76 percent), the belief that law enforcement is more interested in restricting research for security purposes than they are in the scientific value of the work (71 percent), that law enforcement has an overzealous approach to security issues and an interest in censorship (63 percent), and the fear that law enforcement will restrict the publication of some research (55 percent). Scientists expressed a clear preference to leave the monitoring of science to familiar authorities rather than law enforcement. Figure C illustrates that most scientists find it acceptable for a familiar authority such as an institutional biosafety committee (64 percent), institutional review board (63 percent), the head of the department (70 percent), or a government funding agency (60 percent) to play a role in monitoring research. In contrast, there is resistance to FBI (14 percent favorable), state law enforcement (13 percent favorable), local law enforcement (11 percent favorable), private security (11 percent favorable), or campus police (11 percent favorable) playing any role. Despite this reluctance to be monitored by law enforcement, scientists were not completely unwilling to interact with authorities in certain circumstances. The survey asked scientists to consider different circumstances where they might be asked to interact with the FBI and evaluate whether they felt the reasons for contact were good or bad (Figure D, below). Almost all respondents (93 percent) felt that requesting technical expertise in a particular area of science was an excellent or good reason to be contacted, and 80 percent agreed that aiding in an ongoing criminal investigation was an excellent or good reason to work with law enforcement. However, the survey revealed that scientists are generally concerned that they would be asked to monitor the activities of a colleague, which 67 percent felt is not a legitimate reason to be contacted by the FBI. Understandably, scientists looked unfavorably on any role that law enforcement might have which interferes with research (57 percent); funding (52 percent); that invades privacy, such as reading personal emails (62 percent); or provides any role for law enforcement to interpret legitimate research as a potential public safety risk (61 percent). Although some level of suspicion or distrust toward the FBI exists within the scientific community, it is interesting to note that only 15 percent of the surveyed scientists indicated any personal past contact with law enforcement agents in a professional capacity. The general view of these scientists towards the FBI was not significantly different from the views of scientists overall (Figure A, above), however they are more comfortable reporting suspicious activity to the authorities. Seventy-one percent of those who had previous interaction with law enforcement indicated that being contacted as a reference for a foreign student or researcher was a good or excellent reason, as opposed to 58 percent of those who had not. It is likely that this is a result of previous experience, since 30 percent of survey respondents reported that their past interaction with law enforcement was in regard to a visa or security clearance for themselves or a colleague. Nonetheless, the low percentage of scientists with previous law enforcement contact suggests that many of the attitudes of distrust are based upon stereotypes rather than actual experiences and that these perceptions have led to an elevated level of suspiciousness that law enforcement will have to overcome in the future. Together the results show that despite expressed suspicions of the FBI and opposition to law enforcement monitoring research, scientists are willing to aid law enforcement in certain situations. When asked in an open-ended context about what the FBI could do to improve relations with the scientific community, no single solution emerged (Figure E, below). A common suggestion from the respondents was to set up an appointment and approach the scientist in a professional manner. Respondents also stated that it would be beneficial for authorities to first contact the individual’s department head or supervisor and initiate contact through an institution’s official channels. By taking steps to address suspicions early in any interaction and by treating scientists respectfully and professionally, law enforcement representatives are more likely to build a foundation of respect with their interaction and displace existing hostility. Perhaps the single most important step would be to adopt simple procedures for an introductory phone call, email, or letter that clarifies the specific purpose for the meeting and details what the agent hopes to gain from the interaction. To ease the concerns expressed by scientists regarding their collaborators or their privacy, it is imperative that an agent establish clear boundaries about what they plan to do and plan not to do in any interaction. Being clear about the purpose of the meeting should alleviate suspicions and increase the likelihood of full cooperation. Many scientists indicate that an understanding of science by an agent would ease their suspicions and therefore it may be helpful to increase the scientific literacy of law enforcement agents. Among researchers who felt that an official from law enforcement understood their work, 81 percent were receptive to helping in a criminal investigation, while only 63 percent of researchers who felt that a law enforcement official did not understand their work were receptive to helping. From this we conclude that scientists are most comfortable talking about their work to others that demonstrate familiarity with scientific concepts, possibly because they are less concerned that their work will be misunderstood. Our survey shows that scientists share many of the common stereotypes held of law enforcement by the general public. More interestingly, it elucidates some issues that are specific to the science community, such as a general expressed reluctance to discuss research with law enforcement, despite an expressed willingness to share expertise to aid in criminal investigations. Increasing scientific literacy among law enforcement personnel who work with scientists may be one important avenue to ensure a strong relationship and clear communication between the law enforcement and science communities. The consequences of allowing discord between law enforcement and scientists to linger affect public safety as criminal, terrorist, and national security challenges become increasingly technical, and close collaboration with the scientific community becomes even more essential. We hope to apply the lessons learned in this survey towards improving the training and awareness of the law enforcement community in their interaction with scientists. Nathaniel Hafer, Cheryl J. Vos, and Michael Stebbins are with the Federation of American Scientists; Karen McAllister and Gretchen Lorenzi are with the Federal Bureau of Investigation; Christopher Moore is with Greenberg Quinlan Rosner Research; Kavita M. Berger is with the American Association for the Advancement of Science. Nathaniel Hafer and Cheryl J. Vos contributed equally to this work. 1) D. Malakoff, Science. 297, 751-752 (2002). 2) M. Enserink, D. Malakoff, Science. 302, 2054-2063 (2003). 3) J. Couzin, Science. 305, 159 (2004). 4) NBC news/Wall Street Journal Survey, June 12, 2006. The survey – The Federation of American Scientists, in collaboration with the Federal Bureau of Investigation and Greenberg Quinlan Rosner Research, developed a survey to gather baseline data on the prevailing points of view of scientists towards the law enforcement community. The survey contained a mix of multiple choice and open-ended questions. In collaboration with the American Association for the Advancement of Science the survey was distributed to 10,969 AAAS member scientists over a four-week period between January 23 and February 18, 2008. AAAS members were selected if they had a functional email address and had identified their primary field of study as biology, chemistry, physics, earth science, or engineering. Emails contained a link to a secure website where members could answer the survey questions. At the end of the time period 1,332 surveys were completed, and the resulting data were analyzed. The data were statistically weighted to be proportionally representative of the scientific disciplines of the AAAS membership. The margin of error associated with the total data set is +/- 2.7 percent. Thermometer rating system – Two survey questions asked respondents to indicate their feelings towards a particular person, organization, or situation using a thermometer system. In this type of question, respondents give their response as any number between 0 and 100, with 100 being a very warm, favorable feeling, and 0 being a very cold, unfavorable feeling, and 50 meaning not particularly warm or cold. Complete list of questions asked in the survey. Question 1. Please indicate your feelings toward the following people and organizations with 100 meaning a VERY WARM, FAVORABLE feeling; 0 meaning a VERY COLD, UNFAVORABLE feeling; and 50 meaning not particularly warm or cold. You can use any number from 0 to 100, where the higher the number the more favorable your feelings are toward that person or organization. Question 2. The following people and organizations might have some role in monitoring scientific research under certain circumstances. Please indicate your feelings about each one having some role in monitoring scientific research under certain circumstances, with 100 meaning a VERY WARM, FAVORABLE feeling; 0 meaning a VERY COLD, UNFAVORABLE feeling; and 50 meaning not particularly warm or cold. You can use any number from 0 to 100, where the higher the number the more favorable your feelings are toward that person or organization having some role in monitoring scientific research under certain circumstances. Question 7. Suppose you received a message that a (SPLIT A- Law enforcement officer, SPLIT B- FBI agent) wanted to speak with you in your capacity as a scientist. For many people, this might raise some concerns about why the (LE officer/Agent) would want to contact them. Please indicate how concerned would you be that the (LE officer/Agent) would… 1 = Very concerned, 2 = Somewhat concerned, 3 = Not too concerned, 4 = Not at all concerned. Question 8. If you saw something suspicious happening in your workplace that made you concerned about a potential threat to public safety, who would you feel comfortable reporting to? Question 9. Have you or any of your colleagues ever been approached by (SPLIT A – a member of law enforcement, SPLIT B – an FBI agent) to discuss something related to your work as a scientist? If yes, Please describe the circumstances under which you were approached by (SPLIT A – a member of law enforcement, SPLIT B – an FBI agent) to discuss something related to your work as a scientist. Question 10. What is the best way for (SPLIT A – Law enforcement officers, SPLIT B – FBI Agents) to contact a scientist? Question 11. What could (SPLIT A – a member of law enforcement, SPLIT B – an FBI agent) do to improve relations with the scientific community? Question 12. What could scientists do to improve relations with the (SPLIT A – law enforcement community, SPLIT B – the FBI )? Question 13. What is your gender? Question 14. In what year were you born? Question 15. Which of the following best describes the current stage of your career? Question 16. Please indicate how often you work with foreign nationals in you capacity as a scientist. Question 17. 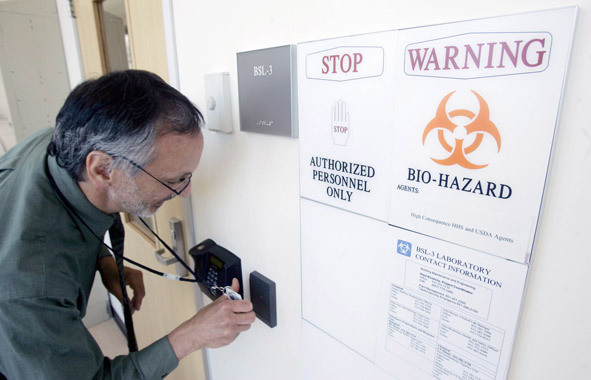 Please indicate the highest biosafety level (BSL) work environment you have worked in. Question 19. Please mark the category that best describes the sector you are employed in as a scientist. Question 20. Please indicate the level of security in your current workplace. Anecdotal evidence, including several high-profile cases of scientists under criminal investigation, has led to the impression that many in the scientific community hold a negative view of law enforcement [1, 2, 3]. While justified in some cases, this divide is a serious liability to law enforcement, since cooperation and consultation with scientists aids in threat assessment, investigation, intelligence gathering, and the recruitment of personnel with specialized skills. But before the two communities can solve this problem with training for law enforcement personnel and through outreach to the scientific community, it is necessary to get a sense of the types and range of views of law enforcement within the scientific community. Here we present the results of a survey of the scientific community conducted in conjunction with the FBI to evaluate the working relationship between FBI field agents and scientists. The survey was sent to 10,969 members of the American Association for the Advancement of Science between January 23 and February 18 of this year. 1,332 surveys were completed, and the resulting data produced an average margin of error associated with the total data set of +/- 2.7 percent. A complete version of the survey questions is available in the supplemental material (Table 1). (View a larger version of this figure.) Almost all respondents (93 percent) felt that requesting technical expertise in a particular area of science was an excellent or good reason to be contacted, and 80 percent agreed that aiding in an ongoing criminal investigation was an excellent or good reason to work with law enforcement. However, the survey revealed that scientists are generally concerned that they would be asked to monitor the activities of a colleague, which 67 percent felt is not a legitimate reason to be contacted by the FBI. Understandably, scientists looked unfavorably on any role that law enforcement might have which interferes with research (57 percent); funding (52 percent); that invades privacy, such as reading personal emails (62 percent); or provides any role for law enforcement to interpret legitimate research as a potential public safety risk (61 percent). Although some level of suspicion or distrust toward the FBI exists within the scientific community, it is interesting to note that only 15 percent of the surveyed scientists indicated any personal past contact with law enforcement agents in a professional capacity. The general view of these scientists towards the FBI was not significantly different from the views of scientists overall (Figure A, above), however they are more comfortable reporting suspicious activity to the authorities. Seventy-one percent of those who had previous interaction with law enforcement indicated that being contacted as a reference for a foreign student or researcher was a good or excellent reason, as opposed to 58 percent of those who had not. It is likely that this is a result of previous experience, since 30 percent of survey respondents reported that their past interaction with law enforcement was in regard to a visa or security clearance for themselves or a colleague. Nonetheless, the low percentage of scientists with previous law enforcement contact suggests that many of the attitudes of distrust are based upon stereotypes rather than actual experiences and that these perceptions have led to an elevated level of suspiciousness that law enforcement will have to overcome in the future. Together the results show that despite expressed suspicions of the FBI and opposition to law enforcement monitoring research, scientists are willing to aid law enforcement in certain situations. When asked in an open-ended context about what the FBI could do to improve relations with the scientific community, no single solution emerged (Figure E, below). A common suggestion from the respondents was to set up an appointment and approach the scientist in a professional manner. Respondents also stated that it would be beneficial for authorities to first contact the individual’s department head or supervisor and initiate contact through an institution’s official channels. 1) D. Malakoff, Science. 297, 751-752 (2002). 2) M. Enserink, D. Malakoff, Science. 302, 2054-2063 (2003). 3) J. Couzin, Science. 305, 159 (2004). 4) NBC news/Wall Street Journal Survey, June 12, 2006. The survey - The Federation of American Scientists, in collaboration with the Federal Bureau of Investigation and Greenberg Quinlan Rosner Research, developed a survey to gather baseline data on the prevailing points of view of scientists towards the law enforcement community. The survey contained a mix of multiple choice and open-ended questions. In collaboration with the American Association for the Advancement of Science the survey was distributed to 10,969 AAAS member scientists over a four-week period between January 23 and February 18, 2008. AAAS members were selected if they had a functional email address and had identified their primary field of study as biology, chemistry, physics, earth science, or engineering. Emails contained a link to a secure website where members could answer the survey questions. At the end of the time period 1,332 surveys were completed, and the resulting data were analyzed. The data were statistically weighted to be proportionally representative of the scientific disciplines of the AAAS membership. The margin of error associated with the total data set is +/- 2.7 percent. Thermometer rating system – Two survey questions asked respondents to indicate their feelings towards a particular person, organization, or situation using a thermometer system. In this type of question, respondents give their response as any number between 0 and 100, with 100 being a very warm, favorable feeling, and 0 being a very cold, unfavorable feeling, and 50 meaning not particularly warm or cold.